A top official at the Department of Roads has said the DoR is mulling over a design audit to find out what could be done to improve the safety level of the ongoing Ring Road expansion project. 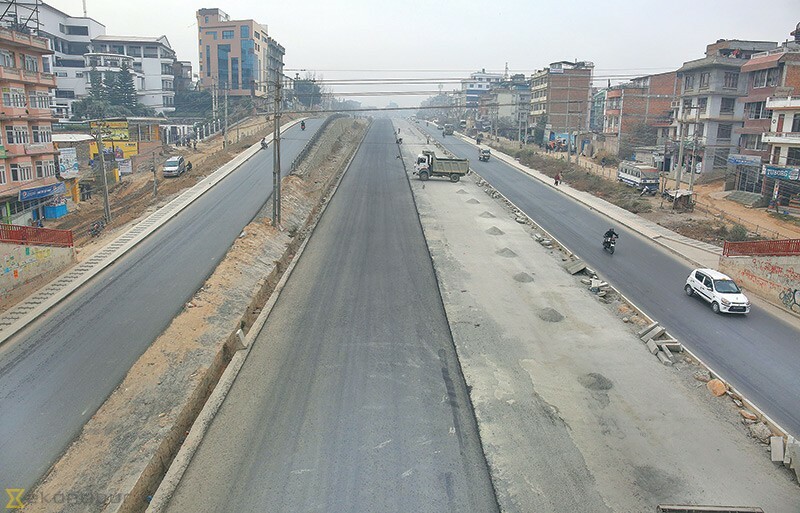 The project to improve nearly 10-km stretch of Koteshwor-Kalanki section has faced huge public outcry for seriously overlooking safety measures of road users. During a public interaction event, organised to build pressure on the relevant bodies to address rising safety issues, DoR Deputy Director General Sanjay Kumar Shrestha had said no major changes could be added to the present design to incorporate safety measures. “We have already passed the design and the nearly 80 per cent of the work has been already completed. Now, we cannot do anything right away,” said Shrestha, who is also the project director. The project director admits the design has errors. These overlook safety issues, but nothing much can be done at this stage when project nears completion. “Our previous officials had passed the design of the project. Later, we found that the design had technical problems especially regarding road safety issues,” added Shrestha. However, the government was thinking of conducting a design audit to find out what could be done to improve the safety level of the road, according to Shrestha. “We are responsible for minimising such damages. For this we will conduct the audit and based on the recommendations of the study, retrofitting of the road will be done accordingly,” said Shrestha. He added it would not be done before the project is completed. The design of the project, which was initiated in June 2013, has total eight lanes. Of the total lanes, four lanes are separated for expressway in the middle of the road whereas remaining four lanes -two-lanes on each side of the road - have been designated as service lanes. As per the design, the main expressway will have four lanes where vehicles can run at the speed of 50km per hour. However, the design doesn’t have any median, dividing the four lane expressway, which the road experts have said that will be leading to fatal road accidents in the future. One of the organisers of the event, mostly attended by representatives from public, government officials, experts among other, environmentalist Bhushan Tuladhar said the road will see massive loss of life due to over speeding and without median, which was missing from the design. “Median are required to separate traffic coming from both sides as well as provide refuge to pedestrians if they crossing the road. It can also be utilised for greenery,” said Tuladhar, adding that even the existing Nepal Road Standards says any road with four or more lanes must have median as wide as possible. Tuladhar suggested that for mixed transportation roads lanes should be wider than three metres as narrower lanes limits unwanted over speeding. Road experts say there is confusion on the status of the road whether it was an urban road or expressway. “It looks like an urban road as it is passing through the urban area. There are things that can be done immediately to prevent damages. We must decrease the speed limit and conduct design audit immediately and follow its recommendations among others,” suggested Laxman KC, Chairman of Road Safety Committee under the Nepal Engineer’s Association. As per the existing Road Safety Manuals of the DoR, four levels of road safety audit are required for any road construction. Experts and stakeholders have also raised concerns about the small numbers of overhead bridges, road crossing points, no road dividers, traffic lights, zebra crossing that are necessary for pedestrians. Some participants at the event pointed out that the project does not have cycle lane and side-walks on either side. This was mentioned in the original contract signed between the DoR and the Shanghai Construction Group Co Ltd, the Chinese company. According to the Global Street Design Guide, such roads should have level crossings at every 60-100 metre distance in the urban environments whereas it should be least as wide as the sidewalks it connects to and not less than three metre wide. Experts have suggested that lanes should be narrowed, which will contribute in expanding area for side-walk and cycle lanes at the same time limit of the over speeding vehicles. The gathering also demanded for separate dedicated bus lanes along the Ring Road.